So I know I'm a bit late jumping on the Bond train but here are my swatches/mani featuring some of the new OPI's. Plus while I wore this a few days ago, I decided to schedule it for today as it is Remembrance Sunday and I thought the name very poignant as without these heroes, there would be no tomorrow. 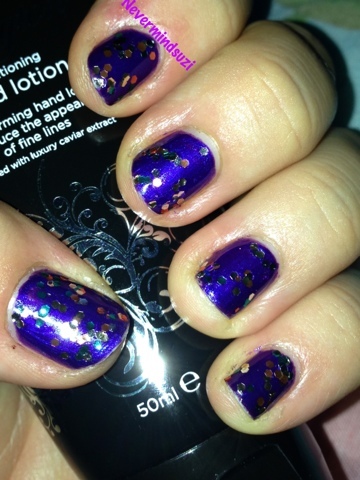 I have used 2-3 coats (I forget, lol) of Tomorrow Never Dies. I would call this blurple as it looks blue in the bottle but more purple on the nail. 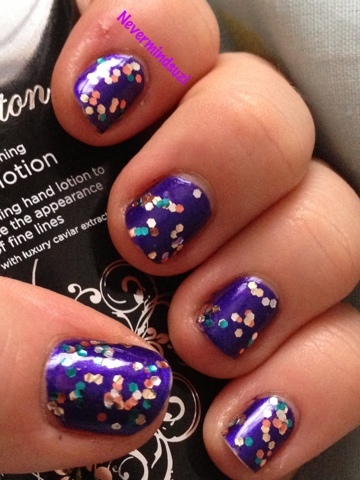 Topped with 2 coats of The Living Daylights, a clear base with gold, copper, silver and blue hexagonal glitters. I like that the pieces of this glitter are all the same size and the selection of colours works well. So have you seen Skyfall yet?